The exhibition, "Object, No Object; Sculpture of Ideas", had great potential, the thought inspiring title getting the visitors’ ideas going, even before stepping into the space. The show featured several locally well known artists, including Sarah Vaeth, who recently was included in the show “Drawing in the Expanded Field”, juried by Deanna Petherbridge at the CSU Hatton Gallery, and Keith Jentzsch, a CSU Art department faculty member, among others. The room, basic to say the least, was large and open allowing for easy traffic flow throughout the exhibits. The large space, a bit sparse, seemed somewhat empty, and the vaporous quality and delicate nature of some of the pieces, like Sarah’s “Snow Cave”, required an extended contemplation by the viewer to appreciate the full beauty of the work. 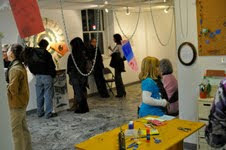 The conceptual based pieces by Rachel Browning and Elizabeth Morisette, featuring art creation by the audience, were unusual with their participatory nature, but the visitors playfully jumped right in, becoming artists. The broad scope of included works, with their disparate styles, could be a bit disconcerting, however the variety instigated an expanding definition of what could be considered sculpture, and ultimately is what the exhibit was about. Keith Jentzsch’s piece "2 x 4", which featured a collection of building materials, really expounded on this idea. He presents the materials as they are, along with the uninitiated artistic creation of a final piece. He raises the question of where, in fact, the artwork is found; it is not just in a finalized object, but also in the process and contemplation by the artist. The ideas, theories and viewpoints presented, offered something for every taste, with contemplative pieces being balanced by playful works. Amy Reckley’s piece, "Gleen/Sweep", at first appearance seems to be merely a 2-dimensional work, similar to a collage, however the meaning is expanded when the visitor learns that the form was a replication or map of the room’s dimensions, and the debris attached to the surface, the effluence from the floor, in effect replicating the space in a secondary way, giving an awareness of one’s presence and perceptions of the time and space in which the work exists. 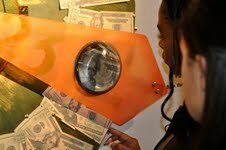 Martin Mayer’s, "Make a Buck", was a fun interactive work that allowed the visitor an alternative way to think about our currency and the perceived value one assigns to random objects. Frank Stanley’s fish, "Steve", was a comic play on human relations with an object, and offered a first hand view through the ongoing monologue of how an object may perceive our dealings with it. 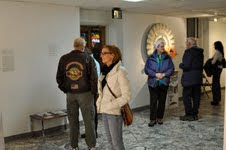 Over all, the successful exhibit was quite enlivening, with art making going on by visitors at two places, and the variety and scope of included styles and mediums expanding the definition of what can be called sculpture today. See more pictures of the event on our Facebook page or on Flickr. On Friday December 3rd we debuted both our exhibits; a onsite invitational including work by local artists and an online international juried exhibit including both photo stills and video. This blog will be continue over be updated over the next few weeks with pictures of each of the installations... So stay tuned, there is still more to come. As you can see, the children in attendance loved being part of the experience so you know the adults did too. Both our online and local communities are to thank for our big success! We sincerely appreciate all your encouragement & support. Front Range Community College is closed for Thanksgiving Break. However, our on-site exhibit at the Fort Collins Museum of Contemporary Art opens in ten days and there is still quite a lot to do in order to prepare the space and promote the event. So today a few of the Museum/ Gallery Studies participants met at the museum. Curtains were created for the space, the last interview for our brochure was conducted and Rachael Browning began installing her piece for the exhibit while participants assisted. From home Flickr sets were pieced together in order to document the process we've gone through, e-mails were gathered, images sifted through to strengthen our online presence and loads of twittering took place! Quite a lot to do and yet we are truly grateful for all the support we've garnered from both our local and online communities which are great sources of encouragement. We appreciate you all, there is a lot to be thankful for this year! I am particularly interested in the developing discourse of what drives interest, audience and the artist. Which is more important the product (object) or the recognition of the process (non-object)? This very question, I believe, is the crux of where the current debate sits among artists, critics and academics alike. I would like to ask you what you believe are the most significant changes to occur in art in the last 100 years and how the audiences’ appreciation has also changed. I sincerely appreciate your time & consideration. Sorry for the delay in getting back to you. John was back for a very short time before he had to travel again to new york and miami. I'm sorry but he will not be able to comment on your project because of his overwhelming travel and exhibition schedule. He sends he best wishes for your project.